Managing Floodplain Development Through the National Flood Insurance Program - Arkansas Floodplain Management Association, Inc. 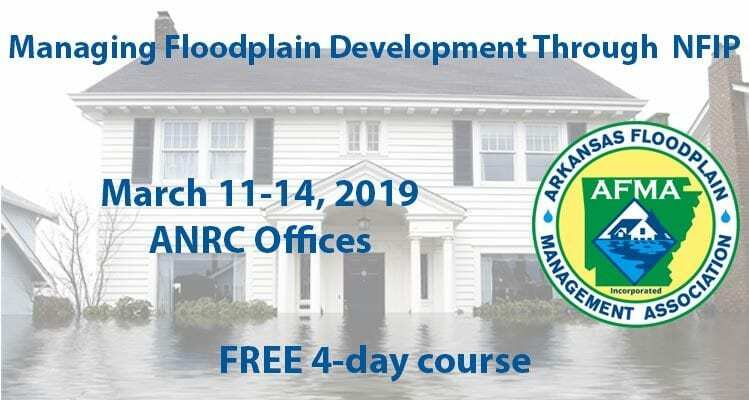 The Arkansas Natural Resources Commission (ANRC), with the assistance of the Arkansas Floodplain Management Association (AFMA) and the support of the Federal Emergency Management Agency (FEMA), will sponsor Managing Floodplain Development Through the National Flood Insurance Program, a four (4) day course on the National Flood Insurance Program (NFIP) and floodplain management. This course will be held at the ANRC Offices on March 11-14, 2019. This course provides local communities with the knowledge and skills to help manage development within flood-prone areas. The course is FREE. However, participants must furnish their own lodging, meals and transportation. A list of nearby hotels is available for your use. Those wishing to attend the course must obtain a FEMA Student Identification Number (SID) and complete an application (FEMA Form 119-25-2). For instructions on obtaining the SID and downloading the FEMA form, go to http://training.fema.gov/Apply/notice.asp. Once you have completed the form, mail, fax or email the form to Whit Montague at the address below. This course is limited to 30 students, so apply early to reserve your space. For those interested in becoming a nationally-recognized Certified Floodplain Manager (CFM), please visit the Arkansas Floodplain Management Association website for more information at www.arkansasfloods.org/cfm/. The CFM exam will be given on Friday, March 15th, from 1 PM – 4 PM, for those interested in earning the CFM certification. If you need assistance or have any questions, please contact Whit Montague at 501-682-3969 or whitney.montague@arkansas.gov.